I think it is safe to say Seattle doesn’t typically come to mind when thinking about sandy beaches. There are plenty of West Coast cities famous for their beaches — Santa Cruz, Malibu, San Diego, and dozens of small towns along the Oregon Coast. While Seattle may not be famous for its beaches, there are a few different spots around town that should keep Seattle in the running for cities that offer great beachy parks, including Golden Gardens Park. The beach at Golden Gardens Park. 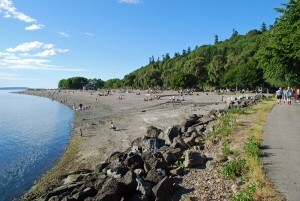 Golden Gardens Park (8498 Seaview Place NW) is located in Ballard and offers plenty of parking. Overlooking Puget Sound, the views of the Olympic Mountains and the sound are spectacular on a clear day. Add some Seattle summer sun, and the park is a great place to spend the day. 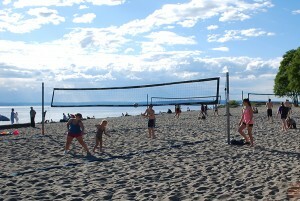 With so many different things to do at the Golden Gardens Park, I bet nearly everyone can find something they enjoy doing. On warm days, the sandy beach is loaded with families enjoying the sun and relaxing. Some even take a dip in the sound (which is still fairly cold even on a nice day). There are also beach volleyball courts and fire pits in the sandy beach area. Nearby are picnic sites, a boat launch, and a dock where people can fish. A walk up the coastline will take you to a more rugged area of the beach with bigger rocks and a view of Puget Sound to the north. The park also offers hiking on forest trails and an off leash area for your dog. Tim and I would recommend reserving the picnic areas at Golden Gardens Park, especially during the summer months. The park gets busy and it is best to plan ahead when possible. We recently learned this this hard way. Tim and I tried to go BBQing one evening on a weeknight at Golden Gardens Park. Unfortunately, everyone else in town had the same idea. There was no chance we were going get a spot at one of the picnic areas. Instead, we strolled along the beach, enjoyed the scenery, and then headed to Magnolia Park to fire up the grill. Even with the crowds, I still think Golden Gardens Park is a great place to relax in Seattle. It really showcases a lot of wonderful qualities this city has to offer. On a sunny day the water sparkles, the views are breathtaking, and there is a great buzz around the park. 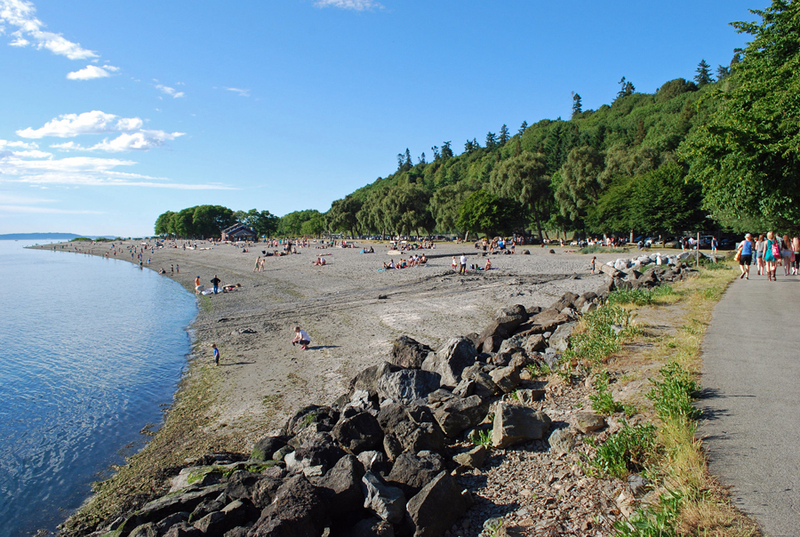 Have you ever been to Golden Gardens Park? What is your favorite thing to do at the park? We would love to hear from you! Please leave a comment below or connect with us on Twitter, Facebook and Google+. Don’t forget to also check out Seattle Bloggers for more fun places to adventure around the Emerald City!